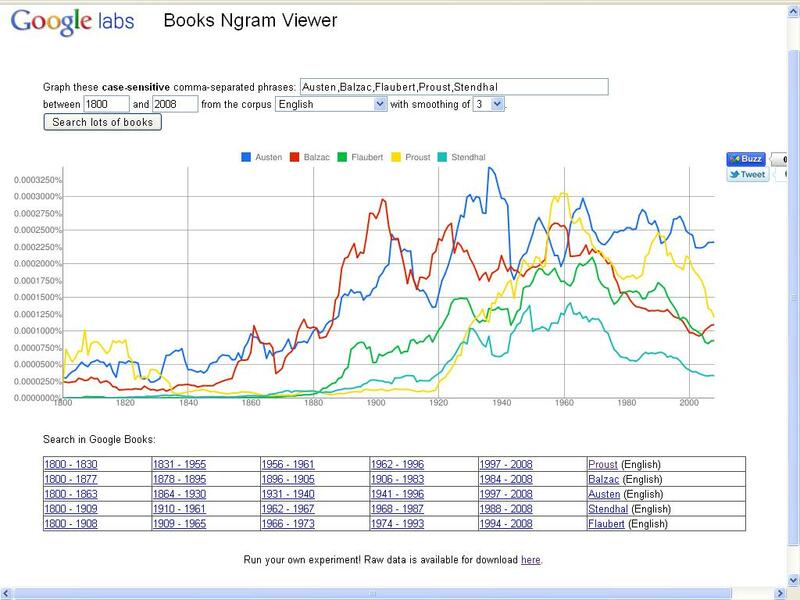 The graph becomes interesting when you compare these authors restricting the dataset to only French works. 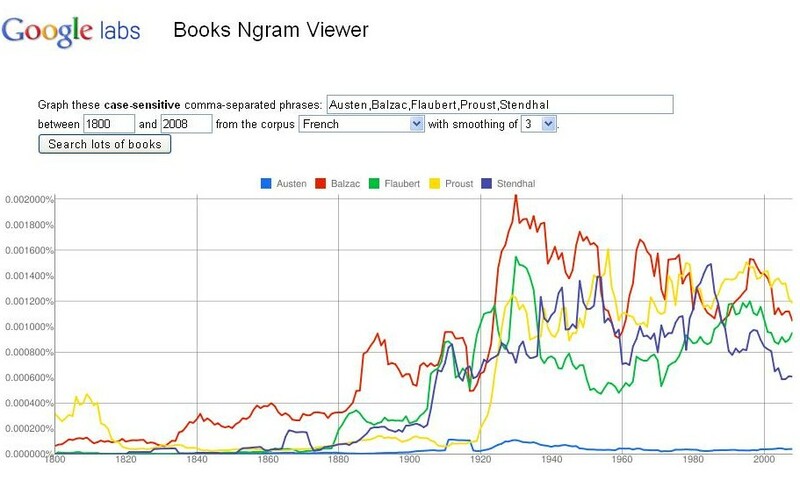 Proust is now the clear top referenced author, although Balzac was again as popular as in the English only dataset, Austen flatlines on the floor of Francophone culture. 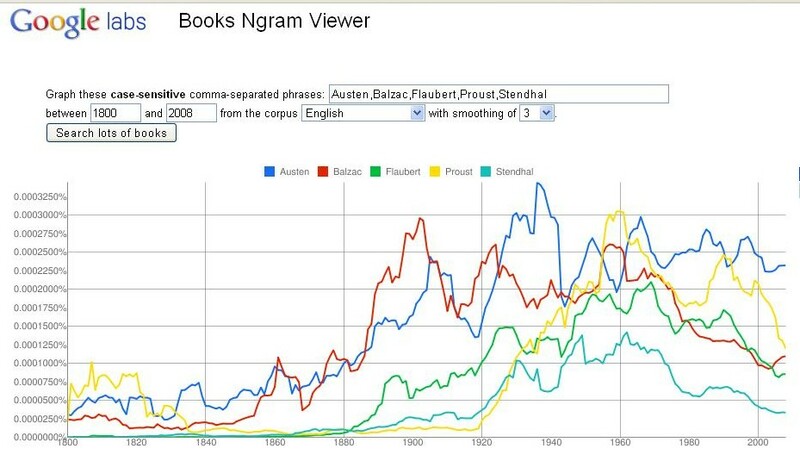 Not sure what this proves, but I’m tempted to carry out further research on all the Novelists on the list, just to determine the most referenced authors in the English and French language. Thanks to all our voters for the new writers of the 21st Century. Out of the seven proposed new novels, both Ned Beauman’s “Boxer Beetle”, and Evie Wyld’s “After the Fire, a Still Small Voice” gained the most with three votes each. I’m told these two are good choices, although I have yet to read either of them. I’m also starting to think that we should only have one selection out of the seven proposed novels – and will therefore select only one of these two works for the List of Novels – once I’ve finished reading them. The average number of Novels selected from our list by our readers is currently 42. In the postscript in this novel, Jean Echenoz states that he wants to destabilise the novel from within. He certainly has a talent for destabilising the reader. This novel is the story of two men who once loved the same women. However, they never realise this fact until the last. They have various adventures across the globe, one ending up in Malaysia and the other on the streets of Paris. Of the woman, Nicole, we now little and somehow towards the end of the novel, both this character and the reader all get dragged into a gangster film and action flick all in one. It certainly is very disconcerting, and not exactly enjoyable. As the reader slowly tackles this difficult novel, the pace quickens and the style changes. As if the book was alive and dragging us through two, and sometimes three different stories. Echenoz sees the novel as an engine to automatically generate stories. Sometimes these motors become infernal machines over which even the author has no-control. This site is always open to new writing, as Margaret Atwood says, new ways of using this story transmission device which most people know as the Novel. Evie Wyld – After the Fire, a Still Small Voice. It is now up to you to decide which one of these seven books should end up on our List. 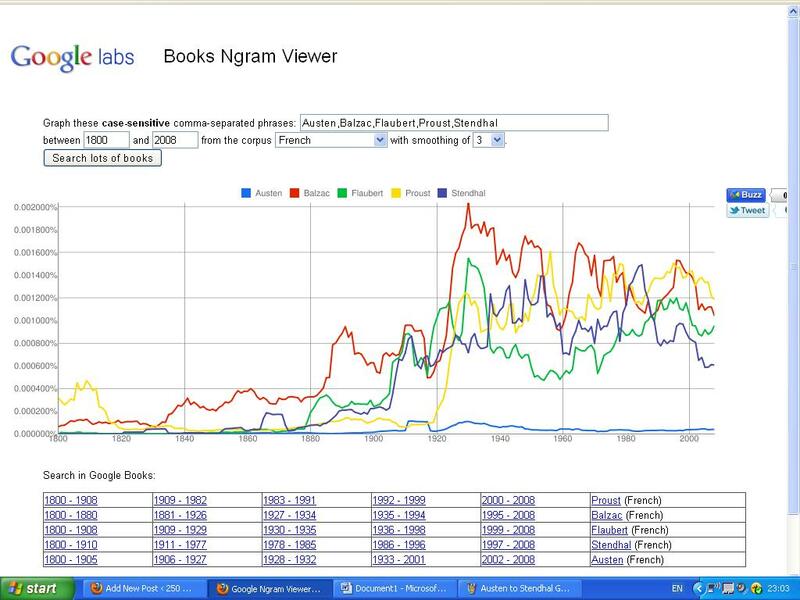 One of these first novels, with the most votes by 26 April, could end up being considered a timeless classic. This poll is now closed – you can have a look at the results by clicking on “Results” in the word-cloud. The List of Novels already contains More’s Utopia and Orwell’s 1984, two of the best examples of Utopias and Dystopias known to the literary canon. Others also on our list, such as Huxley’s Brave New World or Bradbury’s Farenheit 451, created the perfect world which soon turned into their own visions of hell on earth. Nevertheless, we can go further into the depths of Dante’s Inferno and find other authors creating true warnings from history. I’m thinking of some of the clearest messengers of Distopias, such as the queen of the apocalypse Margaret Atwood and her trio of doomed societies, The Handmaid’s Tail, Oryx and Crake and the sequel to this latter’s depressing future world The Year of the Flood (Canada), you can also read Yevgeny Zamyatin’s We (a Russian author who may have inspired Huxley’s work and Vonnegut’s Player Piano), Vladimir Bartol’s Alamut (Slovenia), Ernst Junger’s novella On the Marble Cliffs (Germany), Sony Labou Tansi’s La Vie et demie (Congo), Kadare’s The Palace of Dreams (Albania), Ayn Rand’s Anthem (UK), Ursula Le Guin’s The Dispossessed: An Ambiguous Utopia (US) or Nikos Athanassiadis Πέρα από το ανθρώπινο (from Greece and only ever translated into French as Au-delà de l’humain). Each visitor to this site has nine votes to select which of these fearful tales should we add to the List of Novels you might want to read in your life-time if you get half the chance? This poll is open to everyone – so please tell your friends and family – please feel free to comment once you’ve made your choice. Polling has now closed – Thanks to all our voters. Half of a Yellow Sun by Chimamanda Ngozi Adichie, received thirteen votes and was in first place. were in equal second place with eleven votes each. Since we had agreed that the top two novels in this poll would end up on our list, and based on these results, I propose to add these four books to our List of Novels. “Elle n’avait pas prévu qu’on lui volerait son sac à la sortie du magasin. Encore moins que le voleur jetterait le contenu dans un parking. Quant à Georges, s’il avait pu se douter, il ne se serait pas baissé pour le ramasser”. This is a very Franco/French book, exploring human passions in a light comical way, but juxtaposing this to the requirements of a “normal” bourgeois life between Georges and his wife Suzanne. The latter almost becomes complicit in the affairs between Marguerite and George, which again is a very French way of dealing with a cheating husband. This Novel was made into a film called “Les Herbes Folles” by the Veteran Director Alain Resnais at the age of 87. An expensive production for a Franco/Italian co-production, like the book, the film failed to make any impression outside of France. It might be because of the comical ending involving flies undone in Marguerite’s plane. At only 76 pages, this novel was almost simply a pamphlet, telling the story of a woman’s decent into obesession following the end of a relationship. Of course, this “occupation” and invasion of her mind was not due to despair, but because of her incredible jealousy over the other woman. This novel will not appeal to everyone, whilst reading it, I caught myself thinking Ernaux should just get a grip and get over her bloke “W”. Her work did in fact remind me of some past acquaintances, and lovers, drunk and flaling into the pit of jealous despair. It occupies your mind and can destroy you.